We are happy to share with you the 12th issue of “Struggles and Victories: Waste Pickers on the Frontline”. 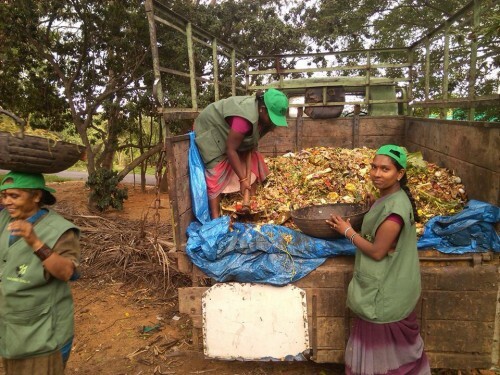 Hasirudala, or “green force” is a membership-based organization of waste pickers seeking to improve our conditions of work and ensure continued access to recyclables in the city of Bangalore, India. To start with, the women workers of Hasirudala have made several advances this past year. Elder waste pickers have demanded and received their pension with the help of a waste picker ID card; women waste pickers are running several biogas plants; a woman waste picker is learning to drive commercial vehicles; a women’s unit is now loading and unloading recycling trucks; and waste picker women are signing MOUs with the municipality to run recycling collection centers in the city. In addition, Hasirudala has created 528 jobs since it began about a year ago; Hasirudala now tracks the workers using their IDs with the help of platform called IGG, or “I got garbage”; waste pickers will be using hand-held mobile devices to enter date more efficiently; Hasirudala is setting up a system for waste pickers’ children to access scholarships; it has opened 250 bank accounts for waste pickers; through the IGG platform, workers are connecting to social services and social security benefits. Read the complete article and see photos. More than 250 members from KKPKP, Stree Mukti Sanghatna and Kachra Kamgar Union along with thousands of workers, farmers, pensioners, slum dwellers and other underprivileged people gathered at Jantar Mantar, Delhi on December 2, 2014 to assert their economic and social rights. These include the rights to land, labor, employment, information, food, education, healthcare, pensions, the forests, and the rights of minorities and social rights. Reductions in health, food security and social sector spending was the context for mobilization by various social movements of the working poor. We the undersigned, are asking the House of Representatives and the Senate of the Philippines to Uphold the Ban on Incineration, as mandated by the Philippine Environmental Laws: RA 8749 or Clean Air Act and Ecological Solid Waste Management Act of 2000: RA 9003, to protect and advance the non-negotiable right of the people to a balanced and healthful ecology in accordance with the rhythm and harmony of nature. We oppose Waste Incineration including waste-to-energy burning technologies because: 1) It is not safe and is in fact dangerous to the health of the people and the environment… (Read the full list of reasons why this technology should be banned). Please sign this petition and together let’s ask the House of Representatives and the Senate of the Philippines to Uphold the Ban on Incineration, protect the people’s sacred environmental rights and implement the mandates of the Constitution. Greetings from Kachra Kamgar Union (KKU)! I am glad to inform you that in October, the Election Commission has started issuing voter cards (EPICs) to waste pickers (KKU members) of Delhi. Now, waste pickers can also cast their votes in Delhi. 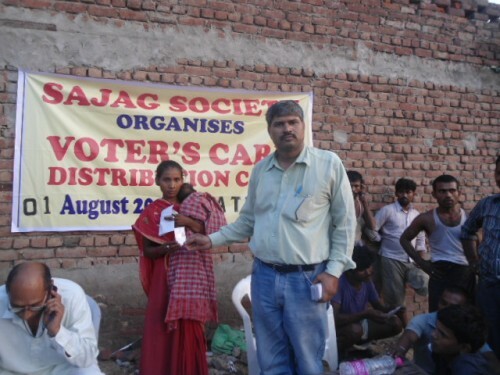 As you already aware that Sajag Society/Kachara Kamgar Union in association with the Commission had been organizing exclusive facilitation camps for enrollment of waste pickers to Electoral Rolls of Delhi in the month of June-July 2014 and after being completed all the formalities, the Commission has been issuing voter cards (EPICs) to waste pickers (KKU members) of Delhi. Around 2000 Electoral Photo Identity Cards (EPICs) have already been issued by the Commission & distributed to KKU members and some will continue to be distributed. See the gallery of photos. 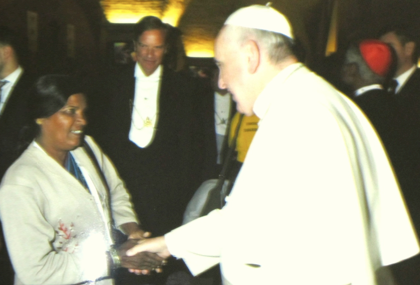 Rebecca Kedari Thomas, a waste picker from Pune, India, participated in the “World Meeting of Popular Movements” held in the Vatican City, Rome on October 27-29, 2014. The convention was structured to discuss ways of social inclusion by reflecting on organizational experiences of popular movements of the disadvantaged and excluded around the world. Pune-based waste picker’s trade union, Kagad Kach Patra Kashtkari Panchayat (KKPKP), was one 150 such organizations. Rebecca shared her struggle of transforming from a waste picker to a service provider. The audience was moved to hear the challenges in KKPKP’s formation and the discrimination Rebecca faced at every level. She added that despite the KKPKP’s existence for 25 years, Pune’s waste pickers are still struggling for recognition by the Pune municipal government and fighting for basic rights like inclusion in social security programs and education for their children. Concluding the event, the Pope assured his support to the social movements and said the structural causes of poverty, inequality, lack of labor, land and housing, denial of social and labor rights need to be combated. Read the complete article. 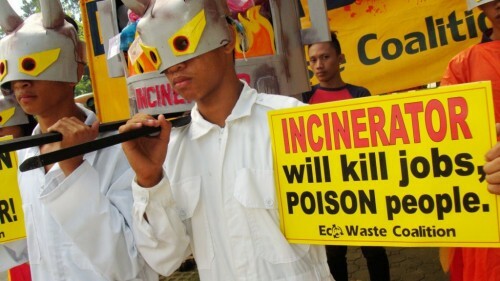 In October, members of the informal waste sector or IWS and community and environmental organizations marched to the Department of Environment and Natural Resources (DENR) and to the House of Representatives to shun attempts to legalize incineration and to protect thousands of waste management-related jobs and valuable resources from ending up in dirty smoke and ash. Led by the zero waste advocacy network EcoWaste Coalition, some 100 waste workers and environmental activists joined the protest march and assembly to express their firm opposition to moves by the Metro Manila Development Authority (MMDA) and some lawmakers to open the floodgates for waste incineration. The group, instead, proposed zero waste approach as the real solution. In the Philippines, over 100,000 workers, by rough estimation, live by means of recovering and selling tons of materials, which go back to factories for purposes of recycling, creating jobs along the way. This could mean that 4,000 waste workers would lose their jobs. As part of Swachh Bharat Abhiyan, a national cleanliness drive in India, Chintan along with Safai Sena, an association of waste pickers, with the support of activist Shazia Ilmi, held an event at Central Park of Connaught Place on October 15th. It was attended by more than 550 waste pickers, senior political leaders and Shazia Ilmi. Ms. Ilmi and Mr. Upadhyay spoke about the role of waste pickers in keeping the city clean and their contribution to this Abhiyan. He assured the waste pickers that he would apprise the central government of the social and other problems faced by the community and try to introduce social security scheme for them. He said the work would be started for providing free medical insurance for them under the social security policy of the government. Waste pickers also spoke about their contribution to the cleanliness campaign by collecting and recycling about 20% of the total waste. Read the complete post with reasons why waste pickers, kabaris and recyclers matter for a Swachh Bharat campaign. 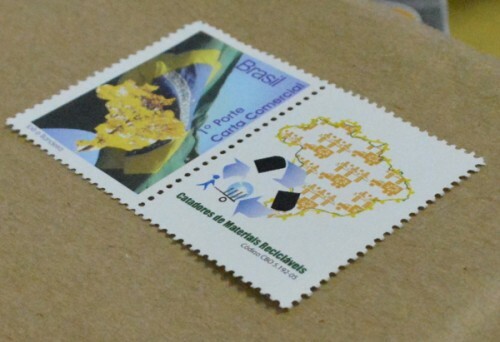 At the opening of Expocatadores, held on Dec. 1, 2014 in São Paulo, the Brazilian postal service issued a stamp dedicated to the country’s waste pickers. The stamp contains the image of the Brazilian flag with an Ipê tree and art produced by the National Brazilian Movement of Waste Pickers (MNCR). 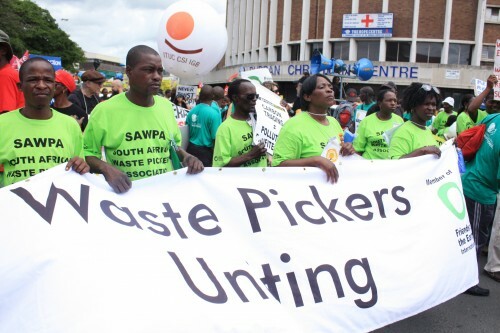 The image displays waste pickers organizing and their inclusion in municipalities’ waste management systems, as a result of the National Solid Waste Management Policy. The objective of issuing the postal stamp is to bring visibility to the advances that waste pickers have made and help promote acceptance of the profession, which has been recognized by the national department of labor policy since 2002. The issuing of this postal stamp is another form of eternalizing and valuing a moment, a date, or an institution. In addition, it is an art form that enchants people from diverse parts of the world. With the issue of this postal stamp, the postal service pays homage to and gives prestige to professional waste pickers. Access the complete article (in Portuguese). 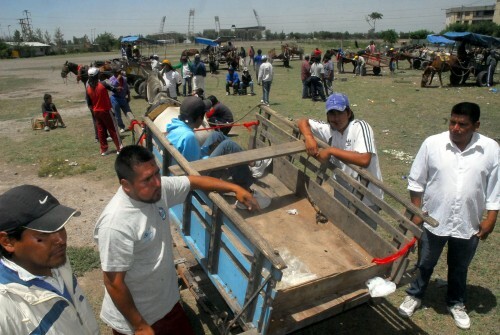 The waste pickers of Salta, Argentina, many of whom collect recyclables using traditional, horse-drawn carts, decided to join the Federation of Waste Pickers of Argentina and the Federation of Workers of the Popular Economy. They decided to unionize to say no more to the intense harassment they had been facing at the San Javier dumpsite and in the rest of the province. Their main objective is to defend their livelihood and their rights. Since 2010, the waste pickers of Salta have been victims of an ordinance pushed by the NGOs that claim to protect animal rights but actually only see them as a business. At the San Javier dumpsite in Salta, it is clear what the municipality’s priorities are: to give contracts to the private company, Agrotécnica Fueguina and leave the waste pickers in the worst conditions, when it is the waste pickers that are providing an important public service for the well-being of Salta. Read the complete article (in Spanish). On the last day of Expocatadores, Brazilian President Dilma Rousseff joined the waste pickers in their annual procession. At Expocatadores, she had listened to the demands of the national waste pickers’ movement (MNCR) and during the ceremony, she joined various authorities and emphasized the movement’s achievements. Roberto Laureano, of the MNCR, said, “As waste pickers, we want to continue being protagonists in this process and that municipalities don’t even need to think about incineration.” He thanked Rousseff for supporting their cause of not extending the national deadline for the closure of garbage dumps. He criticized the weak points and inaccessibility of Cataforte III, the government program meant to strengthen waste pickers’ cooperatives. 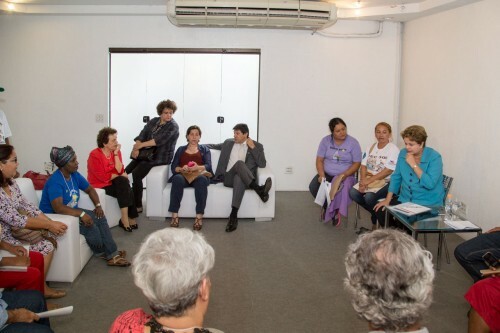 Rousseff said that cooperatives should have the same economic importance as small businesses and that municipalities must be on board for waste-related public policies to work on a national level. Waste picker cooperatives from several cities were publicly handed their awards for successful programs. Mayor Fernando Haddad stressed the need to invest in improving the conditions of recycling centers run by waste pickers. During the ceremony, five agreements were signed, all of which benefit waste pickers’ cooperatives in the areas of training, technical and social assistance, infrastructure and environmental education. “You work with what is thrown away but you also work with possibilities, of building a better future. That’s why I call you the ‘waste pickers of the future’!” said Rousseff. 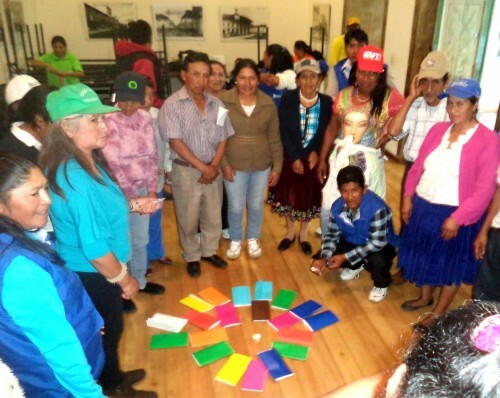 On November 13-14, 2014, in Cuenca, Ecuador, the organized waste pickers (recicladores) of Ecuador gathered together. The assembly consisted of training workshops about leadership and self-esteem; a visit from Alejandro Paredes of Tetra Pak; determining the network’s leaders and updates about president Laura Guanoluisa’s participation in the World Meeting of Popular Movements and her experience with the Pope. Also discussed were advances in political and organizational themes. Members of three regions were present. We are grateful for the support from Yolanda Bueno’s organization and the Instituto Nacional de Patrimonio Cultural (National Institute of Cultural Heritage) for the space we were able to use for two days of intense work. We will continue to advance together!!! We clean the face of the world with our hands. See a gallery of photos from the assembly. 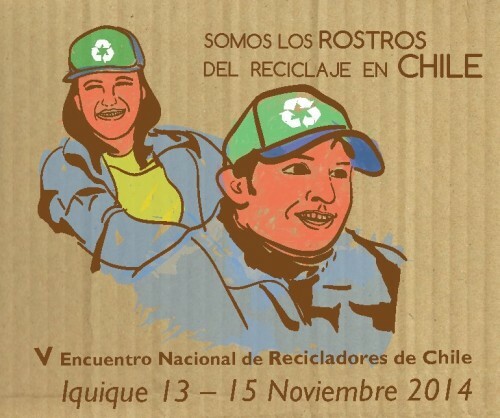 The Chilean waste pickers held our 5th national conference, carrying the motto: “We are the faces of recycling.” Performing this activity every day are more than 60,000 women and men who collect, separate and recycle the waste that society rejects. With our labor we perform more than 60 percent of the country’s recycling, which makes us a very important actor. Despite this fact, we waste pickers, whose labor is of high environmental and economic value, continue to be seen as invisible to most people. It’s that the badly named “waste” has a bad image: people are not used to seeing the wealth that we have seen for a long time. Thousands of individuals and families have started separating and recycling the recyclables they produce at home — but something is missing. As a country, we cannot afford to keep wasting our precious resources: new laws, incentives and education will drastically change our practices around solid waste management over the next ten years. Read the complete article, with the Chilean waste pickers’ demands (in Spanish). On November 8th, during a protest organized by the waste pickers of the Rafey landfill in Santiago (Dominican Republic), Lavo Investment — the Italian company subcontracted to manage the landfill — decided to use violence against the waste pickers who work there. 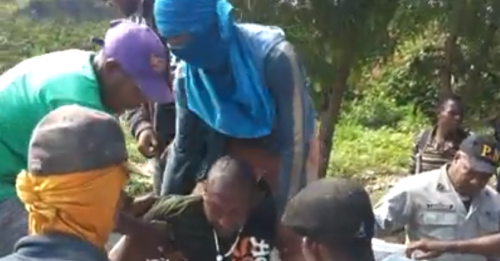 The waste pickers of Rafey were demanding that Lavo Investment pay them for collecting and sorting the plastic and cardboard recyclables at fair prices, or that they allow the waste pickers to sell the materials to small buyers. In response to these demands, the company’s director of security called three bullies that arrived carrying guns, which they starting firing at the waste pickers. Six waste pickers were injured in a show of the company’s authority over the workers. This is the 5th protest the waste pickers have organized in the 10 months (as of November) since the company has been managing the landfill. The company responded to the first protests by lowering the price of recyclables to 40 and 60 percent of what other companies were paying. Watch the video. 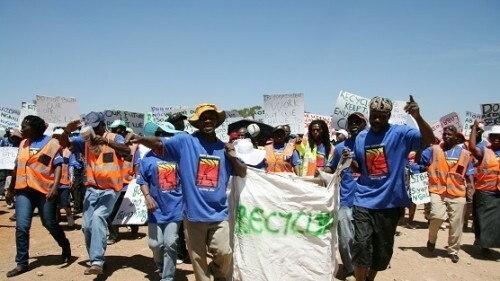 About 500 waste pickers took to the to the streets of Pietermaritzburg, South Africa on December 11th, after three years of waiting for the construction of a materials recycling facility (MRF) at the New England Road landfill. The march was targeted at the provincial Department of Cooperative Governance and Traditional Affairs (CoGTA) which has neglected its oversight over the local and district municipalities in Pietermaritzburg, and also ignored the responsibilities of the two municipalities within this agreement. Financing of R21 million from CoGTA for the Hlanganani ma-Afrika Waste Cooperative as sole beneficiaries of the MRF was agreed upon between all stakeholders involved. The Msunduzi Municipality allocated land next to the landfill site for construction, however, since 2011 the uMgungundlovu District Municipality has indicated no intention of beginning the project despite site hand-over and appointment of a construction company by the district. About 80 members of the cooperative were joined in solidarity by other waste pickers from the landfill. The MRF means that recyclables will be diverted from the landfill, creating better working conditions and incomes. Expansion of the cooperative membership is a future objective so that no waste pickers will need to work on the landfill, where workers have died or been seriously injured. In October, waste pickers in Spain shared experiences of zero waste initiatives with their South African counterparts. Four coordinators and an executive committee member of the South African Waste Pickers’ Association (SAWPA) spent a week in Barcelona, which has become a hub of recycling and composting. Like many towns across South Africa, in Barcelona, waste picking is a socioeconomic phenomenon that has increased over the years due to growing poverty and the economic vulnerability of these marginalized people. Zero Waste Europe and GAIA hosted the waste pickers in Barcelona. These organizations promote a zero waste approach to resource management as critical to creating employment and mitigating climate change. In South Africa, waste pickers perform very little composting of organic waste, focusing on plastic, cardboard, glass, etc. In Barcelona, composting represents a large part of recycling. The aim of the visit was for the waste pickers to demonstrate how this type of recycling takes place so that South African waste pickers can further their work towards zero waste. In a country plagued by over 45% unemployment, hundreds of waste reclaimers and small recyclers will be left without work if the proposed private waste-to-energy incinerator is constructed. Incinerators use recyclables as fuel and this takes away recyclers’ income. Incinerators are a dirty and false energy solution. They create toxic air pollution and drive climate change, impacting negatively on human health. Waste reclaimers and small recyclers ensure that recycling occurs, meaning resources don’t have to be extracted from the ground. Take action and sign this petition in support of green, climate jobs. We want to send 2000 online signatures to the Department of Environmental Affairs to tell them to deny this application. In the fall of 2014, the city of Bagnolet, France, was the scene of a crisis that attracted the media and concerned citizens: the reclaiming of public space by about 500 biffins (waste pickers and scrap dealers) and the thousands of citizens who traded their used goods at the informal market. The city council has in no way sought to normalize this spontaneous activity led by these excluded workers. The city’s leaders have not been interested in restoring peace and creating jobs for this population. The biffins, chased away from the flea markets in Montreuil by the city government, have moved to other areas of the 20th district as well as the 18th district (Barbès, gate of Montmartre). Forced to trade in already saturated and chaotic areas, the biffins’ livelihoods are at stake. The “problem” has simply been moved once again, as it was throughout the previous government. When will we get out of this vicious cycle? On October 27th to 29th, 2014, on the initiative of the Pontifical Council and the Justice and Peace organization, the first World Meeting of Popular Movements was held in Rome and at the Vatican City. 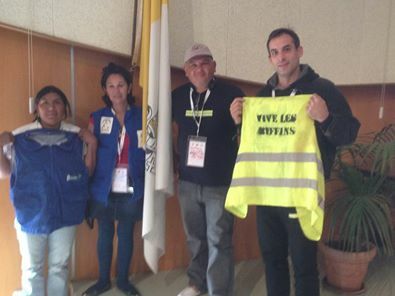 Among the 150 international groups invited (including slum dwellers, the homeless, the landless or climate-change refugees) were waste pickers (recicladores, cartoneros, catadores…) as well as the biffins of Paris represented by the Secretary of the association Sauve-qui-peut (Y. Grimaldi) and the President of the association AMELIOR (S. Le Cœur). The Paris biffins — being oppressed workers, deprived of access to labor law protections, vilified in speeches and excluded from policies that affect them — saw the invitation to the event as a welcome sign of recognition. Though a secular organization, AMELIOR and waste picker participants made it to Rome to participate in discussions that focused on the themes of land, housing, and jobs. They attended working sessions, met other waste picker organizations, and spoke at the assembly about the history of the Parisian waste pickers and their struggle. The biffins representatives also seized the opportunity to visit many formal and informal markets in Rome and meet with local waste pickers and dealers. In the presence of its partners, the waste pickers’ solidarity cooperative Les Valoristes unveiled at the Caisse d’économie solidaire Desjardins the bottom line of its recyclable containers temporary depot installed this summer under the Jacques Cartier Bridge in Montreal, at the corner of Maisonneuve and De Lorimier streets. The operating principle was simple: the cooperative welcomed at the depot, no matter the quantity or quality of the containers brought, anyone bringing recyclable containers in exchange for cash. Although the main users of the deposit were the “valoristes” (waste pickers), happy to be welcomed without prejudice, the Les Valoristes cooperative was pleasantly surprised to see that ordinary citizens, both men and women, as well as institutions, businesses and industries were also taking advantage of the service it offered. In just two and half months of operation, the cooperative has managed to collect nearly 310,000 returnable containers of glass, metal, and plastic, returning more than $25,000 to the community. With 2,400 visits, the depot set up by the Les Valoristes is an undeniable success. Read the complete article (in French). On October 6, 2014, the Coffee Cup Revolution was held in Vancouver, Canada. 169 people from across Vancouver collected coffee cups from garbage cans for a 5 cents refund. 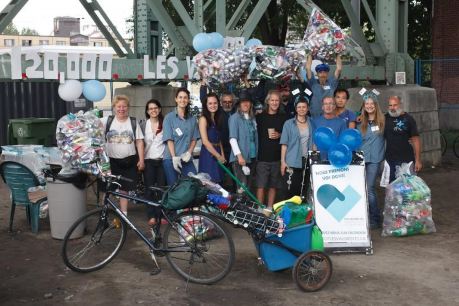 The event was organized to raise awareness of the role that waste pickers play in cleaning up the streets of Vancouver, the amount of waste produced by the use of disposable coffee cups, to connect with binners and share the vision of connecting with other binners on a national and international scale. Over the course of the day, 41,686 disposable coffee cups were collected and binners were paid $2,084. Volunteers also helped build art installations using the returned cups. These demonstrated the transformative role that extending the recycling-deposit system has on the lives of people who survive by collecting recyclables. The event provided an opportunity for community engagement and created a space for social inclusion. Since the Coffee Cup Revolution, monthly meetings have been held with a group of binners who call themselves the Binner’s Project. 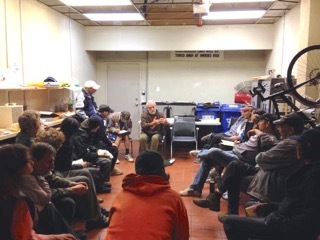 In 2015 the Binner’s Project hopes to continue to build a local network of binners and increase recognition of the work they do in Vancouver and increase economic opportunities for local binners, while also strengthening connections nationally with Montreal and other cities. Read the complete article.